On April 2-4 ARPO President Pete Jackson joined Dr. Andrew Kolodny, PROP, Judy Rummler, The Steve Rummler Hope Foundation, Joanne Peterson, Learn to Cope, and April Rovero, National Coalition Against Prescription Drug Abuse, at the 2nd Annual National Drug Abuse Summit in Orlando, Florida. The event was organized by Operation UNITE and was very well-attended. All of the federal agency heads were there, including FDA Commissioner Margaret Hamburg. While most of the federal agencies appeared to be using the opportunity to boast about all they are doing, CDC Director Tom Frieden stole the show with the clear message that sales are driving the opioid epidemic and that until we address overprescribing we will not solve this epidemic. Congressman Hal Rogers hosted the event and here is a man who we should all view as a hero. He gets it. He understands that overprescribing is the central issue. I was fortunate enough to meet him and have a talk with him, he was very gracious and is very genuine in his dedication to ending the epidemic. Noone has worked harder for a longer period than Rep. Rogers. During the week Dr. Kolodny, Judy and Bill Rummler, April Rovero and myself met privately with Commissioner Hamburg. We made sure that she understood the personal side to this national tragedy, telling her each of our stories. I told her I had been to eight FDA meetings and in that time nothing had changed except the death toll had continued to rise. I said her staff had tuned out the many parents who have traveled to Washington to tell their stories and beg the FDA to tighten the restrictions on opioid medications. She learned that there is a great deal of frustration with her agency, but that she could show leadership by making the decisions that need to be made and she could usher in a legacy of protecting the American public. I think we gave her something to think about. 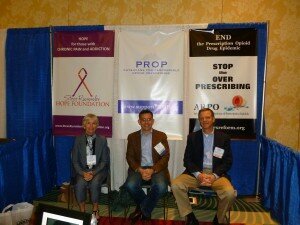 Judy Rummler, Dr. Andrew Kolodny and Pete Jackson in shared booth.